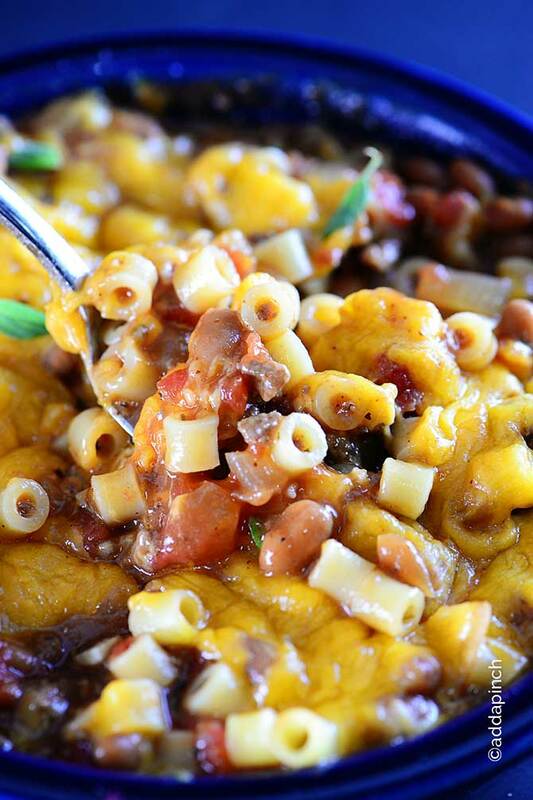 This chili pasta skillet recipe is one pot wonder! Combining two classic comfort foods into one delicious dish! 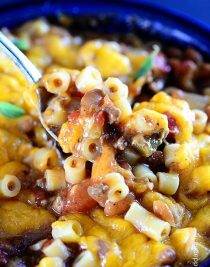 There’s just something about this time of year that has me craving warm chili, soups, stews, pasta, and so many comforting classics. Maybe it’s the trees turning vivid hues of red, orange, and yellow or maybe it’s the warm afternoons that lead into the crisp, cool evenings that have me longing for something warm and comforting. This past week after I returned from our cruise, my body decided that it must need a little break and hit me head on with a sinus infection, coughing, sneezing, sore throat and generally just feeling like cuddling up with a snuggly blanket and napping. Not that I hadn’t gotten plenty of naps while we were cruising! My goodness, it seemed like I caught up on enough naps to have lasted through the rest of the year and beyond! But, even so, I had a visit to the doctor when I returned and came home with plenty of medicines to clear up the sinus infection and make me feel more comfortable. But, I knew that what would really make me feel better was something warm, hearty and soothing to my throat. Not feeling like spending a ton of time in the kitchen, I decided this chili pasta skillet that I make on occasion would be just the perfect thing! Plenty of flavor that I could actually taste, without having to stand in the kitchen all afternoon to make it. I also loved that with it being a one pot dish, I wouldn’t have to spend any time at all cleaning up either! Win, win, win! I started with my favorite black bean chili recipe. 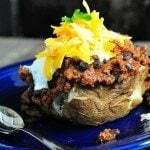 It is a favorite of ours and has plenty of flavor without having to simmer all day. I tossed the ground beef, onion and garlic into a big skillet and cooked until the ground beef was browned and the onions and garlic were tender and fragrant. Then, I threw in the spices and allowed them to cook just a bit in the skillet and stirred them into the beef and onion mixture. I think this adds so much flavor to a dish quickly and is one of my favorite little time saving tricks. Then, I added all of the other ingredients, including this adorable little pasta that I picked up recently, and allowed it to cook, stirring it pretty often, until the pasta cooked to just the right amount of firmness for me. I added the cheese, let it melt and then couldn’t wait to serve up a huge bowl of it! It was just as fabulous as always and instantly made me feel a bit more like myself. 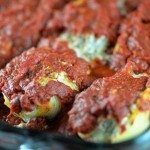 It also makes a delicious dish for serving on game day or even for Halloween get togethers! Warm and comforting, I think it will be a favorite at your house like it is mine! 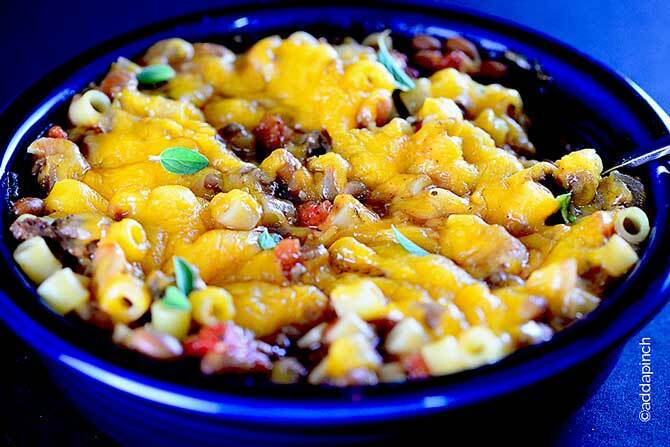 Here’s my Chili Pasta Skillet recipe. I think you are going to absolutely love it! Add bacon, onion, garlic, and ground beef to a large skillet over medium heat. 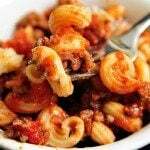 Stirring frequently, cook until meats have browned and onion and garlic are tender and fragrant. Add chili, cumin and oregano to the skillet allowing the spices to heat on the skillet, stir into the meaty mixture. Stir in Worcestershire sauce, tomatoes, beans, and pasta. Stirring frequently, cook until the pasta has reached the amount of tenderness desired. Add cheese to the top of the mixture, cover with a lid and allow the cheese to melt. 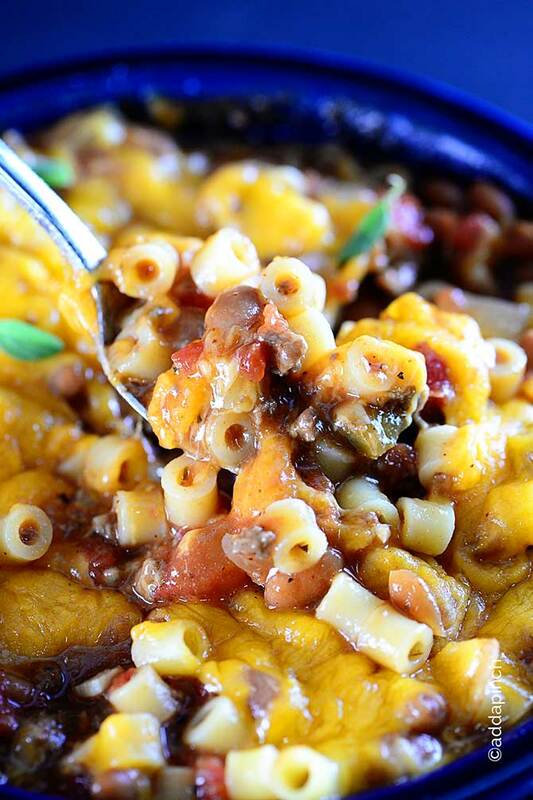 What a perfect, hearty meal for the winter! I LOVE one pot meals and this looks so good! I’m about to make this- can’t wait! 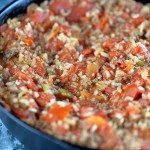 In the instructions where is says put in the tomatoes, does that refer to the can of crushed tomatoes from the chili recipe and the tomato sauce?